Saute the onions and garlic in the oil and butter for 2-3 minutes. Add the spices and cook for 30 seconds. Add everything else and cook for about thirty minutes, until the lentils are soft. I had to make some substitutions as well as my own vegetable stock, since I didn’t have any bouillon cubes on hand. My version’s after the jump. Now that beets are the new spinach, I thought I’d post the recipe for my favorite beet salad. 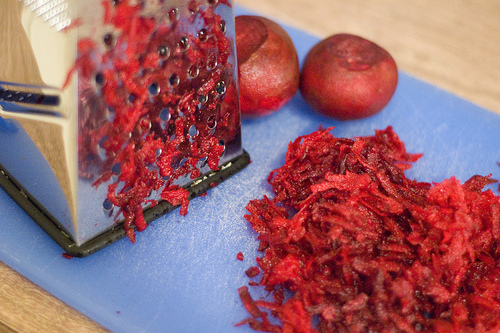 Peel and grate 1 beet and 2 carrots and a 2-3 inch piece of ginger. Stir in some balsamic vinegar or lemon juice, and a little oil if you’d like. The photo is from flickr. You can see more of the photographer’s work here. I’m entering this dish in January’s In the Bag Event. This is quite possibly the best soup I have ever made. First, prep all the vegetables. Peel and chop the onions. Peel the ginger and cut part of it into thin slices (you want to end up with about 1/4 cup sliced ginger) and mince about 2 tablespoons worth of ginger. Peel and chop the carrots. Peel and dice the sweet potatoes. Wash the celery, chop off and discard the ends, and chop. Wash the spinach, chop off the stems, and chop up the spinach. Second, make the stock. Saute half the chopped onion in olive oil. When the onion starts getting soft add the spices. I didn’t measure when I made this, but I would estimate that I used between 1/4 and 1/2 teaspoon each of the curry, cumin, coriander, turmeric, and salt. Basically, you want to give each spice a vigorous shake or two over the onions and you want all the onions to turn a nice golden color once you stir it all in. Now add the sliced ginger, carrot, celery, parsnip, and 8-9 cups of water. Bring it to a boil, then reduce the heat and let it all simmer for half an hour. Put a colander in another big pot, then pour the stock into it. The colander catches all the boiled veggie bits and the pot catches the stock. Third, rinse out the original stock pot and saute some onions in it. You can use olive oil, butter, or a combination. When the onions start getting soft, add the minced ginger and a generous shake of curry, cumin, turmeric, and coriander. Once the onions are very soft, add the sweet potatoes, 1 cup of red lentils, and the stock. Bring the soup to a boil, stirring occasionally, then lower the heat and let it simmer until the lentils fall apart and the sweet potatoes are very soft. Add the spinach and stir. Be sure to add water as the soup boils down – I think I ended up adding 3-4 cups by the time I was through. Once the spinach is cooked, taste the soup to see if it needs more salt or more water. If you think you’ve added too much water, just keep cooking for a few more minutes, until the broth is nice and strong. Jerry cures his chest cold with a massive dose of ginger tea.